Campo alla Sughera is a relatively new winery in Bolgheri, on the Tuscan coast -- they planted their first vineyards, which are located not far from Ornellaia's, in the mid-1990s and produced the first vintage of Arnione, their flagship wine, in 2001. This year at Vinitaly they invited a number of journalists to taste though the various vintages of Arnione, and I was quite pleased to be included. Arnione is a Bolgheri Rosso Superiore, and was initially a blend of Cabernet Sauvignon and Merlot with some Petit Verdot; since 2006 has also contained Cabernet Franc. This is their first vintage, from very young vineyards. Deep black almandine with black reflections and almandine rim. The bouquet is fairly intense, with slightly candied berry fruit laced with greenish accents and a fair amount of underbrush, also a fair amount of alcohol. On the palate it's full, with fairly rich cherry prune fruit supported by smooth sweet tannins that have some graphite bitterness, and also by smooth sweet acidity that flows into a clean fresh cherry prune fruit finish with dusky overtones that fades rather quickly into lasting warmth. It's pleasant, and though clearly from a young vineyard -- it's a bit short and lacking in complexity -- shows considerable potential, and is still very much alive and will drink quite well with roasts (including things such as leg of lamb) and stews, including game. Castagneto's testina di cinghiale, stewed wild boar's head, would be good with this. Deep black almandine ruby with black reflections and almandine rim. This was a difficult, very wet cool vintage for Tuscany, and Bolgheri was no exception. The bouquet is considerably less ripe than a more normal year would be, and it is also more mature, with wet leather and savory accents mingled with some brambles, and not much fruit. Some menthol though. On the palate it's ample and fairly soft, with cherry plum fruit supported by moderate acidity and by smooth sweet tannins that are lighter than they would be in a more normal year, and by warm savory acidity that flows into a fairly long clean prune cherry finish. It's interesting, and displays more richenss of fruit than many 2002 Tuscan wines do. Surprisingly successful, though in a lesser vintage key that translates primarily into a lightness of the tannins. Impenetrable black almandine ruby with slightly brownish rim. 2003 was as hot and dry as 2002 was cold and wet, and the wine does reveal an intensity of color that's a bit unusual. The bouquet is ample and rich, with slightly greenish berry fruit supported by green leather and underbrush, and by clean spice; there's also a hint of sweetness to it, and as it opens petroleum aromas also emerge. On the palate it's ample and rich, with powerful jammy plum fruit supported by moderate acidity -- less than in the 2002, which is to be expected, but also than the 2001 -- and by tannins that are warm and rather aggressive, flowing into a warm tannic finish. It's clearly the child of a hot vintage, one whose heat interfered with the ripening of the grapes, but is pleasant and has a story to tell. Deep black almandine with black reflections and cherry rim, looks a little younger than the 03. The bouquet is elegant, with rich plum cherry fruit supported by slight jammy accents and clean mentholated spice. Considerable depth and very pleasant to sniff; it's also still quite young and still developing. On the palate it's ample and smooth, with rich cherry plum fruit supported by moderate acidity and by smooth sweet tannins that flow into a clean prune laced finish. Quite pleasant in an international fruit driven key, and will drink nicely with succulent, not too fatty roasts. A very pleasant fruit forward wine, and if you like the style, which is decidedly in the direction of elegance and polish, you will enjoy it very much. If you prefer more aggressive wines it won't work for you, but if you like the style it is impressive. Impenetrable black cherry ruby with violet reflections and cherry rim that has hints of black garnet. This was again a difficult vintage, with considerable rain from mid-August on. The bouquet is fairly intense, but nowhere near as rich nor as fruit driven as the 2004; it's rich with minerality and underbrush laced with some prune fruit and cassis, and also underbrush laced with spice. Pleasant in a cooler weather key. On the palate it's ample and quite smooth, with soft moderately intense prune fruit supported by fairly bright brambly acidity and by tannins that have a more distinct cedar underpinning than the 2004, and flo9w into a key prune finish. It's elegant, in a clearly lesser vintage key, and though it doesn't have the voluptuous fruit driven smoothness of the 2004, it does have a story to tell, and will age nicely for at least 5-10 years more. With the 2006 vintage a new vineyard came into production that made Cabernet Franc available. They liked the quality, and decided to add it to the Arnione from the outset. This is 50% Cabernet Sauvignon, 20% Merlot, 20% Cabernet Franc, and 10% Petit Verdot. Deep black cherry ruby with cherry rim. The bouquet is intense, and powerfully fruit driven with rich prune fruit supported by spice and some cedary sweet slightly balsamic accents. Very young in a frankly voluptuous key, and brings to mind a starlet of the Jane Mansfield sort in a glass. On the palate it's ample and very smooth, with rich cherry plum fruit that gains direction from deft slightly dusky tannins and slight mineral acidity that doesn't impinge but whose absence would be noted, and flows into a clean prune plum finish. It's quite young, and will develop further, but the style is by now set. If you like this sort of voluptuous fruit forward wine you will like it very much, but you have to like the style. If you prefer more tannic, aggressive wines, it simply won't work for you. 40% Cabernet Sauvignon, 20% Merlot, 20% Cabernet Franc, 20% Petit Verdot. Deep black cherry ruby with black reflections and cherry rim. The bouquet is fairly rich, and fruit driven but less ripe than the 2006, with redder fruit and some yellow peach as well. On the palate it's ample, but again not as rich as the 2006; the acidity is more marked, and a combination of mineral and sour berry, and the tannins are slightly more splintery, and while this is in part youth, it's also vintage variation. A fellow taster was saying that he found the 2007 readier than the 2006 and I'm not sure I would say that; it may be longer lived however because the tannins are more aggressive and the acidity is brighter. It's also frankly young, and will show much better in a year or two, whereas the 2006 is drinkable now. I also think that, because of its greater acidity, it will work better with foods with respect to the 2006, which is more a wine to drink by the glass far from the table. The vertical was quite interesting; If one takes into account the immaturity of the vineyards with the first couple of vintages, and vintage variations, the wines are clearly cut from the same cloth, following a fairly precise voluptuous fruit driven style in which rich ripe power and smoothness are fundamental components; I generally think of wines of this sort as starlets in a glass, and Arnione takes this to an extreme, especially in the more recent vintages in which the vineyards are more mature. As such Arnione is fairly particular: some people will enjoy it very much, while others will simply find it abhorrent. If you like the style, by all means seek it out. If you prefer more aggressive wines with more marked acidities there are others you will like better. Pale brassy white with brassy reflections and white rim. The bouquet is bright and fresh, with considerable gooseberry mingled with honeydew melon and -- casting PC aside -- sweaty blonde, an aroma I occasionally find in wines that have Sauvignon; here there are also some dusky underbrush accents. On the palate it's ample and rather languid, with soft gooseberry laced honeydew melon supported by fairly bright gooseberry acidity and by moderate tannins that flow into a fairly bright tart finish. Pleasant, though the palate has a slightly dilute feel to it, and will drink well as an aperitif or with simple fish dishes. This is a blend of Vermentino, which ferments in steel, and Sauvignon and Chardonnay, which ferment in wood. It's brassy white with pale brassy reflections and white rim. The bouquet is powerful, with considerable crushed sage mingled with the hops one put into beer (I don't know them well enough to say which) -- one writes what one smells -- and some greenish accents. Particular. On the palate it's ample and rather soft, with languid honeydew melon and tropical fruit supported by moderate savory hop-laced acidity that flows into a clean slightly greenish finish. I'd have liked a little more brightness and tightness to the fruit, which I found rather soft. This is a taglio Bordolese, 60-40 Cabernet Sauvignon and Merlot that spends a year in small oak. The bouquet is bright and fresh, with considerable cassis mingled with violets and some spice, and also slight underpinning vanilla, and as it opens ripe sweet yellow peaches, which do emerge in the wines of Bolgheri. Harmonious. On the palate it's ample, with fairly rich cassis and forest berry fruit supported by dusky acidity and some pencil shaving bitterness, while the tannins are smooth and sweet, and flow into a clean bright berry cassis laced finish. Elegant in a bright fruit driven key that isn't as soft as the Arnione, and will therefore be easier to pair with foods; since we're in spring as of this writing I would be tempted to serve it with something along the lines of lamb chops scottadito, grilled lamb chops. Expect it to go quickly. This is a new wine, a blend of Petit Verdot and Merlot, and is impenetrable pyrope ruby with back cherry rim. Poured ink. The bouquet is powerful, with India ink and ripe plum fruit laced with green leather acidity and spice; it's quick to write but quite harmonious in a very international key. On the palate it's ample and very smooth, with rich dusky prune fruit supported by moderate India ink acidity and bitterness, and by smooth sweet tannins that flow into a long prune laced finish that gradually fades, with the fruit gradually giving way to youthful warmth and cedar. Impressive in a very international key, and -- as was the case with the Arnione -- if you like the style you will like it very much. Again, as with the 2006 Arnione, because of its voluptuously rich softness it's more a wine to drink by the glass than a wine to set out at the table. Something to seek out, but only if you like the style, which takes fruit forward smoothness as far as it can go without going over the edge. Want to know more about Campo alla Sughera? Check their site. Pale brassy white with brassy golden reflections and white rim. The bouquet is pleasant, with rich floral accents mingled with heather and slight savory notes, and also some loquat and a certain pungency. On the palate it's bright, with lively slightly greenish berry fruit supported by savory minerality and some tart tannic acidity that flows into a clean rather herbal savory finish. Pleasant, and will work nicely as an aperitif or with fish based dishes, ranging from pasta sauces through grilled or roasted finish, and also with white meats. In short, a versatile food wine. Also a wine with a nice aging potential, and may well be superior in a year or two. This is a barrel fermented bland of Chardonnay and Sauvignon Blanc. It's brassy gold with brilliant golden reflections the bouquet is fairly rich, with dusky white berry fruit mingled with gooseberry and some spice. Nice depth, and there is also, as it opens, some butterscotch. On the palate it's ample and rich, with fairly sweet honeydew melon fruit laced with gooseberry warmth and supported by smooth acidity and some languidity from the tannins drawn from the oak. Pleasant in a softer key, and will work well as an aperitif or with spicier foods that will be tempered by the softness, which comes form letting the grapes ripen until the end of August. This is a blend of Montepulciano D'Abruzzo and about 20% Sangiovese. It's lively pink with brilliant slightly salmonate reflections and white rim. The bouquet is still closed, though swishing brings up clean berry fruit raspberry and some currant, supported by fairly lively acidity. On the palate it's ample and rich, with clean fresh berry fruit supported by lively raspberry acidity and by delicate tannins that flow into a clean fresh raspberry finish that is fairly long. Quite nice, and will be a perfect summer cookout wine, or a wine to sip with friends on the terrace as the darkness grows and the shadows lengthen. This is a Montepulciano and Sangiovese, like the Rosato, fermented in steel. Deep black cherry ruby with black reflections and cherry rim. The bouquet is fairly intense, with savory slightly balsamic accents and a fair amount of alcohol supporting pleasant prune fruit that opens nicely. On the palate it's rich, with pleasant very smooth prune fruit supported by warmth and some acidity, and by clean sweet tannins that flow into a fairly rich berry fruit finish with some cedary dusky bitter undertones. Ripe but not overripe, and will drink well with grilled meats or light stews. Elegant deep pyrope ruby with purple highlights and violet rim. The bouquet is pleasant, with moderate berry fruit supported by India ink bitterness and spice, and by clean graphite shavings from grapes. On the palate it's ample and quite smooth, with rich cherry prune fruit supported by warm slightly tannic acidity and warmth, and by smooth dry tannins that flow into a clean fresh dry tannic finish with some mineral acidity and slight berry fruit. It's still developing -- barrel samples are by definition but would already be drinkable with simple stews or roasts, and will be quite pleasant in a year's time. This is a blend of Montepulciano and Cabernet Sauvignon, and spends some time in used barriques. It's deep cherry ruby with black reflections and cherry rim. The bouquet is rich, with slightly jammy cherry and forest berry fruit supported by deft slightly greenish acidity and by some but not too much cedar; it's quite harmonious in a rather cheeky key. On the palate it's ample and smooth, with fairly rich cherry and forest berry fruit supported by clean citric acidity and smooth sweet tannins that flow into a clean slightly tanic fairly long tart finish. Pleasant, and will drink nicely with grilled meats or light stews, and will also age well for a year or two. This is a blend of Uva di Troia and Merlot, and goes into older barriques for a time. The bouquet is fairly intense, with cherry prune fruit supported by India ink and some iodine, and by clean cedary spice. On the palate it's full and smooth with rich cherry fruit supported by clean minerality more than acidity, and by smooth sweet tannins that flow into a long berry fruit finish with some prune accents as well. Graceful, in a curvy sort of way, and will drink nicely with drier meats ranging from pork loin though roast beef cooked slightly more well done than rare. It's also a wine that will be nice by the glass far from the table. The Merlot makes itself heard. Impenetrable pyrope with black reflections and cherry rim. The bouquet is muted at first swish; more brings up some cassis mingled with India ink and some cedar with underlying spice. Nice balance and fairly harmonious,. On the palate it's ample and very smooth with fairly rich cassis fruit supported by some dusky acidity and by sweet tannins that flow into a smooth sweet finish kept alive by fairly bright currant acidity that does have some dusky accents. Very typical of Merlot, and very smooth, it's smooth enough that in terms of accompaniments it will work best with drier meats, and it is also a wine to be drink by the glass far from the table. Impenetrable pyrope with pyrope rim. The bouquet is fairly intense, with deft herbal accents mingled with warmth and spice; and supported by jammy berry fruit and some alcohol. On the palate it's ample, with rich cherry fruit supported by fairly bright berry fruit acidity and smooth sweet tannins that flow into a clean berry fruit finish. Pleasant, in a fairly rich key, and will drink nicely with grilled meats or light stews. Impenetrable pyrope with violet rim. The bouquet is intense, with India ink and some cumin seed mingled with prune fruit and pleasant airy richness. Quite nice to sniff. On the palate it's ample and quite smooth, with rich cherry plum fruit supported by smooth tannins that have a slight dry sandalwood underpinning attributable to youth, and flows into a clean rather dry finish. Very young, and needs another year at least for the tannins to smooth and fold in. When they do it will be very nice, and quite approachable in a smooth fruit driven key. In sort, a wine to give some time to , and it will also age nicely for 8-10 years and perhaps more. One doesn't necessarily associate the Abruzzo with sparkling wines, but the Abruzzesi are making them, and presented a selection this year at Vinitaly. They range considerably in style, from strictly autochthonous Pecorino to Pinot Nero, and from the metodo charmat through the metodo classico, which means that there are spumanti Abruzzesi for a wide variety of occasions. It was an interesting presentation that I rather enjoyed. Pale brassy gold with brilliant greenish highlights and fine perlage. The bouquet is fairly intense, with savory accents and sweaty blonde 8one writes what one smells), mingled with some milky cheesy savory accents, which may sound odd, but work well. Enticing. On the palate it's fairly rich, with clean savory white berry fruit laced with clean floral accents and minerality supported by peppery sparkle that confers a degree of creaminess. Pleasant and will drink quite well as an aperitif, or as a vino da tutto pasto, a wine for the meal. This is a non-vintage blend of Pinot Nero and Chardonnay. It's pale brassy gold with brilliant golden reflections and fine perlage that bubbles up and settles. The bouquet is intense, with breadcrumbs and floral accents mingled with butterscotch and some spice with underlying hints of bitterness. On the palate it's ample, with pepperiness from the sparkle, which is a little too sharp to make the wine creamy, and lively lemony acidity that flows into a clean fairly rich finish with savory citric acidity. Pleasant in a slightly large shouldered key; it brings to mind a person who has overdone it though slightly in the weight room, while the acidity and savory accents keep it interesting. Muscular and enthusiastic. Pale brassy white with brassy reflections and white rim; fine perlage. The bouquet is fairly rich, with sweaty blonde mingled with some chalk and spice, and a pleasant degree of overripeness. On the palate it's ample, rich, and soft, with clean minerality supported by considerable softness and some savory accents that flow into a clean mineral finish that gains creaminess form the sparkle. It will work quite wella s an aperitif or with foods. This is 60% Trebbiano and 40% Verdicchio, and is pale brassy yellow with fine perlage. The bouquet is quite mineral with some greenish accents mingled with gunflint minerality. On the palate it's ample, creamy, and mineral, with moderate mineral-laced citric fruit supported by minerality and citric notes that flow into a fairly long rather bitter finish. Mineral is the dominant characteristic in this case. This is a rosé from Montepulciano D'Abruzzo, and is salmon with brilliant reflections and fine perlage. The bouquet is bright, with sour berry fruit supported by acidity and peppery spice. On the palate it's ample, and softer than I expected, with moderate berry fruit supported by sparkle and mineral acidity that flow into a clean finish with some metallic accents. I found it to be the weakest of the five wines presented, and though I found it interesting froma wine tasting standpoint, it didn't excite me. Taken as a group the five wines show that the Abruzzo has good potential as a sparkling wine region. In particular, I found the Pecorino-based wines to be interesting. Marramiero's Pinot Nero-Chardonnay blend was also good, but a bit more anonymous -- there are may great sparkling wines made with these grapes in other parts of the world, and to present the blend in the Abruzzo seems to me like reinventing the wheel. The final two, a Trebbiano Verdicchio blend and a Montepulciano, were weaker. Pleasant, but I don't see either attracting attention on the international stage. The second morning of Vinitaly I ran into Tom Hyland, who told me he would be meeting with the folks at Mastroberardino that afternoon, to taste all sorts of things including some older wines, and would I be interested in coming? Of course, I said -- Radici, Mastroberardino's flagship Taurasi, ages extremely well and I was certain other things would too. As often happens at Vinitaly, I arrived a few minutes late and therefore scribbled to catch up while Tom and Karen Phillips (whose notes are here) chatted and tasted at a slower pace. This is from a vineyard planted on calcareous soils that contribute to the bouquet; it's brassy yellow with brilliant brassy reflections, and has an elegant bouquet with floral accents and clean slightly savory honeydew melon. Quite pleasant. On the palate it's full and languid, with elegant, almost chewy honeydew melon fruit laced with savory accents and some smoke from the grapes, which flows into a clean fairly savory finish. Very pleasant in a rich rather voluptuous key, and will drink well as an aperitif, or you could open it on the terrace as the stars come out. This is a single-vineyard wine. It's brassy gold with brassy greenish reflections, and has a rich bouquet with floral accents and hints of honeysuckle and spice. Quite nice. On the palate it's ample and languid, with pleasing richness and fruit, honeydew melon with loquat supported by clean acidity that flows into a clean bright finish with loquat acidity and some savory accents. Quite nice in (again) a rather voluptuous key; it will work very well as an aperitif, or with egg or cheese based dishes, and will also go quickly. They set aside 3000 bottles of the 2002 vintage; the next vintage available will be the 2006. Brassy gold with brilliant golden reflections; it's a pretty color. The bouquet is fresh -- no tiredness about it -- but also mature, with considerable minerality and some underlying acidity. On the palate it's full and bright, with elegant minerality and mineral acidity that flow into a long clean savory finish. Quite nice, and once again conferms that many Italian whites are much more ageworthy than people commonly give them credit for. This is from a vineyard whose elevation is 500 meters above sea level, with an abundance of calcite and magnesium, which do contribute. Pretty label too. The wine is brassy gold with greenish highlights. Elegant nose with rich savory honeydew melon supported by spice and honeysuckle; it gives an impression of sweetness, and is graceful too. On the palate it's rich, with clean fresh loquat fruit supported by sea salt and bright citric acidity that flow into a long warm savory finish. Quite pleasant and will work very well as an aperitif or with grilled or fried fish; a fritto di paranza, mixed tiny fried fish, comes to mind. An ideal summer wine. This is their only barrel-aged white; which ages in acacia -- not oak -- for 6 months. Pale brassy white with brilliant brassy reflections. The bouquet is deft, with honeysuckle and faint greenish mentholated accents mingled with slight sea salt. Delicate. On the palate it's graceful and rich, with deft greenish white berry fruit supported by a degree of sweetness and slight savory underpinning too. Quite pleasant, and the finish has some warmth and wood smoke. It will work nicely as an aperitif or with grilled or roasted fish, and will also age nicely for a number of years. This is a Rosato di Aglianico, and is delicate salmon with brilliant salmon reflections and onionskin rim. It's intentionally quite plae. The bouquet was still sorting itself out with tart berry fruit and some underbrush supported by strawberry and hints of raspberry. The palate is fresh and rich, with soft berry fruit -- sour strawberry and raspberry -- supported by considerable warmth that flows into a long warm finish. It will be quite nice as an aperitif or with cold cuts and simple foods, and would also be a good bet at a cookout. A lark of a wine, which will go quickly. This is the first vintage of a new wine; they have repropagated three or four Aglianico vines from old vineyards that have very small, loose bunches. The bouquet is fairly rich, with clean berry fruit supported by smoky accents and some underbrush, with underlying spice. Nice balance and quite a bit going on, especially for a first vintage. On the palate it's bright and rich, with clean berry fruit supported by moderate vegetal acidity and smooth sweet tannins that flow into a fairly quick finish. It's quite nice but clearly from a young vineyard -- hence the shortness -- but has great potential for future vintages. It's something to buy and drink this year, but will be something to look out for anon. This is from a 40-year old vineyard, and is deep pigeon blood ruby with garnet reflections and rim. The bouquet is quite young, with hot chewy cherry fruit laced with underbrush and spice. Quite nice but needs time, at least a couple of years. On the palate it's full and rich, with powerful berry fruit supported by clean bright berry fruit acidity and some cedary accents that flow into a clean rather dry finish. Very young, and though one could drink it now with a succulent roast, it will benefit from another year or better yet two, and richly reward those who can wait longer. The score reflects today. This is their Aglianico base, which spends a year in botti, the traditional large wooden casks, and is then bottle-aged for 10 years. Deep almandine with almandine rim paling to orange. The bouquet is elegant, with brandied cherries and dried flowers mingling with green leather, some smoke, savory accents, and underlying pungency. It has a lot to say. On the palate it's full, rich, and quite smooth, with rich slightly balsamic berry fruit supported by deft mineral acidity and by silky tannins that flow into a clean bright finish that gradually fades, revealing warmth and balsam-laced brandied cherries. Quite pleasant, and the lack of pronounced wood influence is especially nice, because it allows the Aglianic to strut its stuff unimpeded. One hates to pour it out, at least I did. Deep almandine ruby with black reflections and almandine rim. Looks young. The bouquet is powerful and elegant, with berry fruit supported by balsamic accents and hints of brown sugar laced with cedar and mentholated spice. Great complexity and harmony, and with more swishing peppery accents also emerge. On the palate it's rich and full, with powerful balsamic cherry fruit supported by warmth and sweet tannins that do have a slightly cedary underpinning, and are also directed by a degree of warmth. It has more depth and substance than the 98 Irpinia, and is clearly a better wine, but the other has a gracefulness born of the grape going it alone, without oak, that this lacks. Which you prefer will be up to you, because both are very, very good. Deep almandine with brilliant almandine rim. The bouquet is richer than the 98's and also a bit more mature, with pronounced leaf tobacco supported by savory accents and hardwood ash, with underlying dried flowers, balsamic accents, and some sweetness. A lot going on. On the palate it's full, rich, and very smooth, with powerful sour berry fruit supported by smooth sweet tannins that are decidedly velvety and move effortlessly, flowing into a clean rich brandied cherry finish with warmth, leaf tobacco, and clean spice that gradually fade into unending warmth. It's extremely elegant, and will drink well with roasts or stews; it's also a wine I would consider drinking by the glass, though I wouldn't suggest this to everyone: you should only drink it far from the table if you like brasher wines that are very much alive, supported by lively acidities. If you like the style, it's superb. But if you like softer wines, you will like it better with foods, from rich stews and roasts through succulent grilled meats. 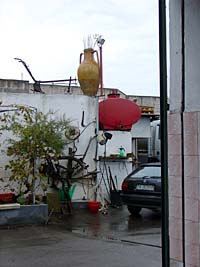 It was still raining when we departed Vinicola Savese, and drove to the Consorzio Produttori Vini Maestri in Primitivo (see also this page), Manduria's cooperative winery. A distinct change of pace; the structure is huge -- 400 growers confer grapes -- and as you enter, to the left you'll find the area dedicated to the sale of vini sfusi, bulk wines: People bring their own containers, which the staff behind the counter fill using pumps that rather resemble gas pumps. The wine is priced according to alcohol content -- the stronger wines are more expensive, and some of the clients tailor their purchase to their palates, asking that their containers be filled with so much of this and so much of that. Business was brisk, and it was nice to see how many people came to buy wine while we were there. Of course the Consorzio does much more than sell wine in bulk: They make many bottled wines, and also have a fascinating farm culture museum that is well worth a visit even for those who don't drink wine at all. This is a tank sample, to be bottled in 2 weeks. The wine is an 80-20 blend of Fiano and Verdeca. It's brassy white with brassy reflections and white rim. The bouquet is quite fresh for a barrel sample, with pleasant floral accents and considerable sweetness; a fellow taster says confected, and it's quite approachable in a sweet key. On the palate it's rich and sweet with honeydew melon mingled with citric acidity and clean very green acidity that flow into a clean melony finish. Pleasant, and will drink quite well with foods; it seems sweeter than it is and this is in part a characteristic of the Fiano. A good wine to drink as an aperitif or by the glass, and if you like fairly sweet soft whites you will like it. This is a Negroamaro, and not yet bottled. It's pale pomegranate red and pink reflections. The bouquet is candied, with bubblegum and cherry fruit supported by some herbal accents. On the palate it's ample and moderately rich, with sour berry fruit supported by bubblegum sweetness that goes into a fairly ling finish with savory accents. Fresh, young and direct. Gioviale: this is a 2009 Vino Sfuso, or bulk wine that's 15.5% alcohol; it's sold from November through December (1000 quintali, 10,000 cases) and people line up to buy it. It's deep black cherry ruby with cherry rim. The bouquet is fresh and jammy with cherry plum fruit that's fairly sweet. Sweet on the palate too, with prune cherry fruit supported by smooth sweet tannins that flow into a sweet finish. A classic strong jug wine, and quite clean, will drink well with foods but is strong. 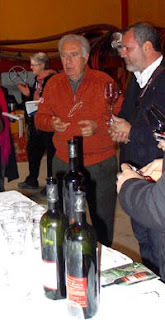 Primitivo Secco is their primary vino sfuso, of which they make 4,000 Quintali -- 40,000 cases -- and we tasted the 2008. It's deep black cherry ruby with cherry rim, and has a fairly bright bouquet with red berry fruit and some plum mingled with deft greenish accents. On the palate it's fairly light, with clean slightly bitter prune cherry fruit supported by moderate acidity and smooth sweet tannins that flow into a clean finish. It's a classic house wine, something one would expect to find by the carafe in a trattoria, and drinks quite well in a simple, direct upfront key. Lively pyrope with cherry rim. The bouquet is moderately intense, with sour berry fruit supported by some greenish accents and a fair amount of alcohol. Direct, up front, and bright eyed; more swishing also reveals some sweetness. On the palate it's medium bodied, with fairly intense prune fruit supported by moderate acidity and tannins that have a slight cedary feel from grapes, and flow into a clean rather bitter finish. Simple, direct, and clean, an unpretentious wine that will drink quite well with foods. Perfect with a burger and you will want a second bottle. This is 14% alcohol; it's deep pyrope with black reflections and cherry rim The bouquet is moderately intense, and has prune fruit supported by dusky acidity and some graphite shaving bitterness, also leafy underbrush, and some acidity. On the palate it's ample, soft and smooth, with moderate berry fruit supported by tannins that have a slight burr and some acidity, which flow into a smooth rather bitter finish. No residual sugars here, and no overextraction; it's rather vinous and correct, and will drink well with foods. This spends a time in small wood. The wine is deep pyrope with pyrope that has slight almandine accents in the rim. The bouquet is fairly intense, with prune fruit supported by slight cedar and hints of nutmeg, and also greenish acidity with hints of wood smoke. On the palate it's ample, with moderately intense prune fruit supported by savory accents and spice. Nice balance; it's fairly direct and will do a fine job of supporting what it's served with -- simple grilled meats or light stews. Nothing cloying nor overextracted about it, and it is easy to drink. This is aged in barriques for a time. It's impenetrable pyrope with violet rim. The bouquet is fairly intense, with prune fruit supported by slight sweetness and hints of licorice. On the palate it's ample and fairly soft, with plum cherry fruit supported by smooth sweet tannins. Direct, and will drink well with foods; it's not overly rich and will drink well with foods. Another wine the Consorzio sells in bulk. Deep pyrope with purple reflections and cherry rim. The bouquet is fairly sweet, with plum fruit laced with slight licorice and a fair amount of sweetness. On the palate it's sweet, with fairly rich plum fruit supported by moderate acidity and by tannins that have a dusky cedary burr and flow into a fairly long bitter finish that keeps the wine from being cloying. They say it's what their parents drank, and again goes to show that sweet wines were once part of the tradition. One that should, I think, be revived. This is sweet, and is lively ruby with black cherry rim. The bouquet is fairly rich, with plum fruit supported by licorice root and spice. Nice balance. On the palate it's ample and bright, with cherry plum fruit supported by deft berry fruit acidity and by smooth sweet tannins that flow into a clean rather licorice-laced prune finish with considerable sweetness. A pleasant dessert wine. Impenetrable pyrope with black reflections and cherry rim. The bouquet is fairly intense, with cherry plum fruit supported by some gum Arabic and licorice root, and a fair amount of sugar that's not quite brown, but in that direction. With time the Gum Arabic surrenders to nutmeg and some spice. On the palate it's ample and sweet with fairly rich plum fruit supported by tannins that have a warm peppery burr and flow into a clean sweet prune finish with a distinctly greenish tannic underpinning. With respect to the straight Madrigale it's more charged, and I found it more aggressive and a little less well balanced. After tasting the Consorzio Produttori Vini Maestri in Primitivo's wines, we tasted those of a number of other wineries, some that are well established, and others that are just getting started. This estate used to make table grapes, but decided to shift over to wine. This is their first vintage. Non-vintage, but a 2009. This is their first wine. Lively salmon ruby with pomegranate accents, and brilliant electric pink highlights. It's a Negroamaro, and the bouquet is intriguing, and very young, with vegetal accents mingled with heather and menthol, also some sweetness. On the palate it's fresh and young, with sour berry fruit that has some bitter orange accents, and slight milky overtones. Very young, and needs another few months. It will drink nicely this summer. Non-vintage, but a 2009. 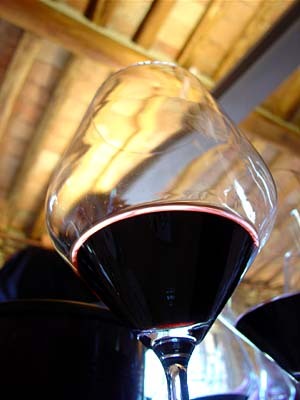 The wine is deep black almandine with black reflections and cherry rim. The bouquet is ripe, with lively very sweet cherry fruit supported by jammy mentholated accents. It gives an impression of sweetness. On the palate it's ample, with moderate sour berry fruit -- it's not as sweet as the nose suggests -- supported by clean rather bitter tannins that flow into a bitter finish. It's a bit rough around the edges, but will drink well with succulent meats. This is a Fiano Minutolo; they call it Rufiano because Puglia doesn't allow people to use Fiano for Fiano Minutolo. This is the first vintage, from 3-year old vines. It's brilliant brassy yellow with golden reflections and white rim. The bouquet is intense, with candied citron with some underlying minerality. Intriguing On the palate it's ample, with moderately rich lemony fruit that has some orange accents, and flows into a long citric finish with slightly greenish tannic underpinning. It's not as tight as I might have liked, but does display a certain grace, and because of its lively acidity it will drink well with rich foods such as fried fish or grilled fish. This has some Zinfandel, cuttings of which the winemaker brought from the US in his suitcase and planted a dozen years ago. It's deep black almandine with black reflections and cherry rim. The bouquet is pleasant, with spicy savory accents and some nutmeg mingled with prune fruit and some cedar-laced spice. On the palate it's ample, with fairly rich cherry plum fruit supported by smooth sweet oaky tannins that have a dusky burr, and by moderate acidity that lead into a fairly aggressive tart peppery finish. Pleasant, aggressive, and quite young; it will drink well with succulent grilled meats or light stews. Deep black almandine with black reflections and cherry rim with purple overtones. The bouquet is fairly intense, with floral accents and succulent red berry fruit with slight dusky accents. Fresh. On the palate it's ample, and quite young, with fairly rich prune cherry fruit supported by some sugars and by tannins that have a peppery sparkle, and by moderate graphite shaving bitterness that becomes savory with time. Pleasant in a youthful key and will drink well with grilled meats or light stews. This is 85-15 Primitivo and Cabernet Sauvignon. Deep black almandine with brich rim and black reflections. The bouquet is fairly intense, with berry fruit supported by prune and some bitter underbrush. On the palate it's full, with rich prune fruit supported by deft prune acidity and by some sugars, but not so many that it's cloying, and by smooth sweet tannins that flow into a clean sweet dusky berry fruit finish. Pleasant, and though the Cabernet Sauvignon isn't invasive it does contribute, and the wine is quite approachable in a fairly international key. Deep almandine with black reflections and brick rim. The bouquet is fairly intense, with sour berry fruit and warmth mingled with some vanilla and cedar. Nice balance and fairly rich in a very young key. On the palate it's bright, with rich sour cherry fruit supported by slight sweetness and by tannins that are warm and cedar laced, and flow into a warm smooth finish with some jammy strawberry accents that carry at length. Quite fresh, and quite young, and will drink well with roasts or stews, though it will also age well for a number of years. 17% Alcohol. It's inky pyrope with black reflections and cherry rim. The bouquet is powerful, with very ripe prune fruit laced with cedar shavings and licorice root; it's a brooding presence in the room. Impressive, and as it opens prune jam emerges too. A great lot going on. On the palate it's full, with rich plum prune fruit supported by alcohol, which confers sweetness, and by some residual sugar that adds softness and jaminess, and by tannins that have a cedary feel to them that brings coffee and cola to mind, and flow into a long sweet prune finish. It's impressive in a very charged, concentrated key, a huge wine that will take no quarter: Either you will like it or you will find it over the top. A fellow taster says, "Lush is fine in certain circumstances." This is a blend of Negramaro and Malvasia, and is dusky pink -- not quite red enough for pomegranate -- with pink reflections and white rim. The bouquet is rich, with lively sour cherry fruit supported by mentholated accents and some licorice root, and by some underlying sweetness. On the palate it's softer than I might have expected, with bubble-gum laced red berry fruit supported by moderate acidity and some tannins that flow into a clean slightly green sweetish fruit laced finish. This is a Fiano Minutolo. It's brassy gold with golden reflections and white rim. The bouquet is intense, and quite aromatic, with strong mentholated greenish spicy notes that bring Brylcreem to mind Interesting, and particular. On the palate it's soft and fairly sweet with mentholated lemon fruit supported by sweetness and moderate acidity that flow into a rather soft finish. I'd have liked more tightness to it. This is a new winery, and the vineyard (6 ha) is from 2005. This is their second vintage. In steel. Deep black almandine with black reflections and cherry rim. The bouquet is fairly rich, with warm prune cherry fruit supported by leafy underbrush and some cedar-laced spice from grapes. Quite pleasant, in a youthful key, with pleasant complexity. On the palate it's full, with rich cherry plum fruit supported by moderate acidity, and by peppery tannins from grape, that flow into a clean peppery fruit laced tannic finish. A nice expression of Primitivo, and though the vines are young it has quite a bit to say. Future vintages will be quite interesting, especially if they continue along this oakless path. 14.5% Impenetrable black almandine with black reflections and cherry rim. The bouquet is intense, with cherry prune fruit supported by dusky leafy underbrush and some cedar, and hints of licorice root. Quite young. On the palate it's ample, with fairly rich prune fruit supported by dusky bitter graphite shavings and some spice, Deft, and young, and still developing, Nice depth, though it is a tad aggressive in its youth; this is in a tasting situation, and the aggressiveness will vanish by a steak. If you like wines that have a bitter cast you will enjoy it very much. Deep black almandine with black reflections and cherry rim. The bouquet is fairly rich, with red berry fruit supported by underbrush and dried leaves, which opens to reveal some greenish accents and hints of orange skin. Nice depth. On the palate it's ample and rather soft, with plum cherry fruit supported by cedar laced tannins that flow into a fairly cedar-laced finish. I found it a bit oaky, even though we were told it only spends a few months in oak. Impenetrable pyrope with dusky black reflections and violet rim. The bouquet is powerful, and smoky, with considerable pungency and some cedar, but not that much fruit, and the oak is overshadowing everything. The palate reflects the nose; it's rich and fruit driven but has a lot of oak that somewhat blunts it. Their vineyards are pruned in the Alberello, or shrub style, and are 60-70 years old. Until 2004 they were part of the Cantina Sociale, of which they were founding members. Impenetrable pyrope with black reflections and purple cherry rim. This spends several months in wood, and has a bouquet with powerful smoky cedar and underlying prune fruit; the cedar covers the fruit at present, though there must be quite a bit for some to manage to emerge. On the palate it's ample, with fairly rich prune fruit supported by milky acidity and by cedar-laced tannins that flow into a clean prune finish. Pleasant though it's quite young, and needs another year or two, and -- for me -- the wood is rather invasive. If you like the style you will like it very much. Deep black almandine ruby with black reflections and almandine cherry rim. The bouquet is impressive, and quite rich, with cherry prune fruit supported by clean bright berry fruit acidity and some greenish vegetal accents with hints of licorice and rubber that are laced with jammy accents. On the palate it's full and smooth with bright prune fruit supported by deft prune acidity and by smooth sweet tannins that have a slight leafy underpinning and flow into a long warm finish. Quite pleasant, in a rather feisty key, and will work very well with red meats or light stews, and also has the legs to age nicely for 5-10 years. Worth seeking out. 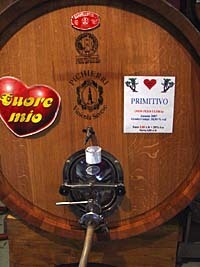 This was the first estate to bottle Primitivo di Manduria. This is 17% alcohol, and is semi-secco, with 7 g/liter of sugar. It's impenetrable pyrope with black reflections and black almandine rim. The bouquet is fairly intense, with berry fruit supported by plums and hints of cumin and gum Arabic. Interesting and still very young. On the palate it's full, and fairly rich, with plum cherry fruit supported by plum acidity and peppery tannins that flow into a peppery prune finish with some underlying sweetness, Pleasant, but needs another year or two; at present it's in mid stride, and despite the alcohol content and concentration it isn't there yet. This is with indigenous yeasts, and they also put some stems in the tank because they liked them. This is the first vintage for this vineyard. Impenetrable pyrope with cherry rim. The bouquet is powerful, and impressive, with jammy plum fruit supported by clean vegetal accents and pleasant spice, laced with some licorice root and hints of cumin. Great depth. On the palate it's drier than one might have expected, with warm licorice laced prune fruit supported by warmth and sweet slight green tannins that have a youthful burr and flow into a clean frankly bitter finish. Impressive in an extreme key; it's very much a niche wine, and if you like the style -- it's very aggressive -- you will like it. But you have to like the style, and it takes no quarter. Impenetrable pyrope with cherry rim. The bouquet is fairly intense, with considerable cedar and some jammy prune fruit laced with bitter cocoa and some spice, and underlying sweetness. A fair amount going on in a warm spicy key. On the palate it's rich, with ample prune fruit supported by prune laced acidity and tannins that have a slight cedar laced burr and are fairly splintery and dry. The finish is fairly long, with plum accents and lasting warmth. Pleasant in a very rich style, though it will profit from another year or two. By comparison with many other Primitivi, this has enough concentration to stand up to the wood. Impenetrable pyrope with purple rim. Poured ink. The bouquet is powerful, with prune fruit laced with licorice and some spice, and has some jammy accents. On the palate it's full and rich, with prune cherry fruit supported by clean sweet acidity and by smooth sweet tannins that clean fresh prune finish. Quite elegant, and very pleasant to sip, with a great lot to say. Impressive. Impenetrable pyrope with black cherry rim. Poured ink. The bouquet is fairly intense, with wood smoke and some cedar overlaying prune fruit and some savory accents. On the palate it's ample, and fairly sweet, with prune cherry fruit supported by moderate bitter prune acidity and smooth sweet tannins that flow into a fairly bitter finish. It's quite young, and I'd have liked a little more depth to it -- she said some of the vineyards are quite young, and this has an impact upon the wine, which comes across as thinner than it will in a few years, when the vineyards have more time under their belts. This is from a selection of Aglianico; it's impenetrable pyrope with cherry rim. The bouquet is fairly intense, with cedar-laced berry fruit and some underbrush that are supported by smoky notes. Lots of oak. On the palate it's ample, with fairly rich cherry fruit supported by bright cherry acidity and by smooth sweet tannins that do have a slight cedar overlay and flow into a warm tannic finish. Quite pleasant, but very young, and needs another 2-3 years to come together. Also, the vineyards are quite young, and it has great potential for the future. In short, a wine to keep an eye out for, and to look for future vintages of. They have 10 hectares, and started to bottle in 2001. Before then they sold the wine in bulk. This is a Negroamaro, from 70 year-old vines trained in the Alberello style. Lively almandine ruby black reflections and almandine in the rim. The bouquet is fresh and vinous with lively sweet prune cherry fruit supported by jammy accents and some peppery spice with underlying minerality. Quite pleasant, On the palate it's full and rich, with vinous cherry fruit supported by bright berry fruit acidity and some greenish licorice accents, and is supported by clean spicy tannins with warm peppery mineral accents and some underlying green licorice that flows into a clean mineral finish with tart berry fruit. Bracingly alive, and will drink very, very well with grilled meats or roasts, and will also be nice with game. It also has the capacity to age well for many years. Beautiful harmony and very pleasant to drink. Deep pigeon blood ruby with cherry violet rim. The bouquet is fresh and rich, with mineral laced prune fruit that has some jammy accents and prune jam, and hints of nutmeg as well. Great finesse. On the palate it's ample and rich, with fairly sweet prune fruit supported by some sweetness, minerality, and dusky bitterness that provides direction and keeps it on its toes. Pleasant, and very nice; it will drink very well with drier meats, for example roast pork loin. A beautiful, rather languid expression of Primitivo, well worth seeking out. The Benegiamo family has owned the Masseria since 1930. They have 14 hectares of new vineyards around the Masseria, in addition to 6 hectares of vineyards trained in the Alberello style in other parts of the province of Lecce. They get their white grapes from growers in Alberobello. Lively cherry ruby with black reflections and cherry rim paling to white. The bouquet is fairly rich, with berry fruit supported by some brambly underbrush and delicate spice from grapes, also some alcohol. On the palate it's ample and rich, with powerful cherry plum fruit supported by lively berry fruit acidity that has a slight greenish cast, and is supported by smooth sweet tannins that flow into a clean fresh berry fruit finish. Quite pleasant in a lively rather zesty key, and will drink nicely with grilled meats or stews. Harmonious too, and a nice balance between fruit, acidity, and tannins. All the pieces are well in place. Worth seeking out. Deep pigeon blood ruby with black reflections and cherry rim. The bouquet is delicate, with prune fruit supported by delicate slightly bitter floral accents and some cedar from grapes. On the palate it's ample, with fairly rich bright prune cherry fruit supported by fairly rich acidity, and dusky tannins that have graphite shaving bitterness and flow into a savory, peppery tannic finish. It's slightly lacking in fruit, and as a result the tannins step in a little more than I might have liked, doing a good job, but in an angry sort of way. This in a tasting situation; it is a food wine that must be served with foods, and in the face of a hearty venison stew the music would be different. But it is aggressive, a little too aggressive for me. I met Alessandro Bianchi, founder of the Azienda Agricola Villa and one of the first to believe in Franciacorta, a number of years ago, when I was gathering the notes for the itinerary of Franciacorta that appeared in issue number 5 of the paper edition of the Italian Wine Review. It was the last appointment of the day and I was probably late, but he graciously stopped whatever he was doing, took me around, and then we ended up sitting in his office, sharing a bottle of bubbly, and chatting about this and that. It was a wonderful end to the end of a long but productive day. Since then I have made a point of visiting Villa as often as opportunity allows: His daughter Roberta and her husband Paolo are just as pleasant as he is, they organize delightful events, and their wines are very good. They were mobbed this year at Vintialy, but did find space for me in a corner of their stand. Pale brassy white with fine perlage. The bouquet is deft, with pleasant greenish citric accents mingled with gunflint minerality, wet breadcrumbs, and some savory spice. On the palate it's ample, rich, and fairly soft, thanks also to some sweetness -- it's brut but not bone dry -- with bright slightly greenish white berry fruit supported by creamy sparkle and fairly soft acidity that flows into a clean peppery finish with some hints of breadcrumbs and minerality. A classic Satèn, which will be very nice as a wine to toast with, or to drink with friends when you want a smoother softer but still substantial and complex sparkling wine. 80% Chardonnay, 10 each pinot bianco and pinot nero. Pale brassy gold with brassy reflections and fine steady perlage. The bouquet is rich, with white berry fruit supported by wet breadcrumbs and slightly greenish minerality, with pleasing gunflint as well. It's a bit richer than the 2005, and more opulent, and this is because the vintage was richer. On the palate it's ample, with pleasant cramy white berry fruit supported by minerality and deft citric mineral acidity that flows into a clean bright citric finish. Quite pleasant, and will drink well as an aperitif or a tutto pasto, with foods at a meal. In fact, I would rather drink it with an elegant fish risotto or grilled or roasted fish -- I'm not a fan of oysters but it would be nice there too. This is 60% chardonnay and 40% Pinot Nero, and is elegant onionskin with paler rim and fine perlage, The bouquet is fresh, with raspberry and white berry fruit laced with breadcrumbs and spice, quite fresh and still very young. On the palate it's bright, with considerable dry minerality supported by mineral acidity and some raspberry citric acidity that flows into a clean fresh finish in which the sparkle, which is creamy at the beginning of the sip, becomes peppery and adds life. Considerable depth and quite pleasant to sip; it will be a pleasant aperitif or a nice option if you want to dine with a sparkling wine. Worth seeking out. This is 80% Chardonnay and 20% Pinot Nero, and after a part of the wine spends several months in oak, it all spends 48 months on the lees. Pale brassy gold with brassy reflections and intense perlage. The bouquet is elegant and intense, with wet breadcrumbs mingled with gunflint minerality and slight greenish accents, and pleasing sour lemony acidity. Quite a bit to say. On the palate it's quite nice, with clean lemony fruit that gains definition from slightly pungent gunflint minerality and creaminess from the sparkle, while it all flows into a clean bright sour lemon finish that lasts and lasts. Quite nice, and will be very nice as an aperitif, and also be nice with foods especially creamier dishes, ranging from pasta through fish and white meats. In short versatile, and will drink nicely in many situations. Worth seeking out. Pale brassy yellow with fine perlage. The bouquet is elegant, with wet breadcrumbs mingled with gunflint minerality, delicate sour lemon acidity and sea salt, and though it's quick to write it's also quite pleasant to sniff. On the palate it's rich, with clean minerality supported by gunflint and some bitterness, while the sparkle confers creaminess, and it flows into a clean mineral finish with some breadcrumbs, and peppery accents from the sparkle. Pleasant, and will drink nicely as an aperitif or with foods; it is as are most of Villa's wines, quite versatile. A prerelaese sample; it spends 5 years on the lees. Pale brassy gold with fine intense perlage. The bouquet is elegant, with greenish minerality supporting breadcrumbs and savory notes, and slight butterscotch as well that adds depth, while the fruit is greenish sour lemon. On the palate it's full and rich, with elegant slightly sour lemon fruit supported by deft minerality and creamy sparkle that has a pleasant savory underpinning, and flows into a clean fresh slightly citric finish. Very pleasant and displays considerable depth, though it's still young -- it was just disgorged and has yet to recover from the insult. By the time it leaves the cellars, in fall 2010, it will have. This was disgorged in 2007 and has by now recovered. It's pale brassy yellow with slight greenish reflections and fine intense perlage. The bouquet is quite intense, with powerful slightly greenish gunflint minerality laced with breadcrumbs, though what really emerges is the gunflint, and also intriguing sour lemon acidity; it's quick to write but very harmonious and quite pleasant to sniff. On the palate it's ample and creamy with rich sour lemon fruit supported by mineral citric acidity and some gunflint bitterness, and flows into a clean fresh mineral finish. Quite nice, and has a great deal to say; it will drink nicely as an aperitif, but is a wine I would be more tempted to simply break out and enjoy with friends far from the table, Lots to say. Pale salmon with fine perlage. The bouquet is fairly rich, with delicate red berry fruit supported by breadcrumbs, savory accents, and some sweetness. On the palate it's ample, and sweet -- a demisec -- with moderately rich forest berry fruit supported by acidity and creaminess from the sparkle, which flow into a pleasant fairly sweet finish. A nice dessert wine that will drink well with creamy desserts and similar, and will also be something to break out with friends who want to enjoy a sparkle on a summer afternoon. This is a new wine from the Campèi vineyard, and is soft pressed and fermented in steel. They decided to call it an IGT instead of a Curtefranca DOC because the DOC doesn't allow the mention of the varietal on the label. It's pale brassy white with brilliant brassy reflections. The bouquet is rich, with sweet honeydew melon and white berry fruit supported by pleasing vegetal notes and some underlying sweetness. On the palate it's ample and rich, with powerful loquat laced tropical fruit supported by greenish spice from grapes and warm slightly vegetal acidity that flows into a fairly long fruit laced finish. Pleasant in an opulent fruit driven key, and though it is still very young it is quite drinkable; it will be nice as an aperitif with egg or cheese based antipasti, and will also be nice with flavorful, not too fatty fish or white meat dishes. A nice addition to the line. The next day of our Puglia trip started in the rain, which is standard in the winter, and to be honest I wasn't as impressed as I should have been at the first sight of our first stop, Vinicola Savese: The winery is decidedly ramshackle, because Vittorio Pichierri, who was there to greet us, and the rest of the family care little for appearances, and -- I discovered -- prefer to devote all of their energy to what's growing in the vineyards and aging in the tanks. A sound philosophy all winemakers should follow, but it somehow doesn't always work out that way. In any case, Vinicola Savese is something of an institution and always has been; 30 years ago when people mentioned Primitivo their name came up, as did the town of Sava, and the Cantina Sociale -- Manduria proved sharper from a commercial standpoint, affixing the grape name to its appellation, Primitivo di Manduria, but the quality in the region at the time was more centered around Sava. Vittorio's winemaking is strictly traditional from the vineyard on; they used to source grapes from farmers who trained their vines in the traditional Alberello style, but now only grow their own. He ferments in cement-lined tanks, because he finds that they work well. 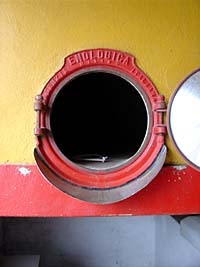 He doesn't employ temperature control as such; during fermentation he puts his hand on the steel door of the tank, and if it feels too hot does something to correct the situation. Other than that, he pumps the wine over the cap by hand 3-4 times per day, and when he decides it's ready, racks it off the lees and into underground tanks where it slowly continues to ferment until Christmas, at which point the alcohol content of the strongest wines is about 18%. He has tried fermenting with cultured yeasts, but didn't care for the results, and therefore returned to the yeasts naturally present on the skins of the grapes. After this brief introduction, we began to taste, and it was an eye-opening experience: Vinicola Savese's wines are completely unlike anything else we have tasted on this trip. For me, they set the standard for Primitivo, and though they are stylistically quite different, I found affinities with the Barolo of Bartolo Mascarello and the Brunello of Gianfranco Soldera: they display a crystalline purity that is extremely rare in wines. This is 13% alcohol, and is a beautiful violet that stains the glass. Pleasant bouquet with brandied cherries and some graphite mingled with underbrush. Quite fresh. On the palate it's full, rich, and sweet, with powerful warm sour cherry fruit supported by clean slightly green sweet tannins that flow into a sweet brandied cherry finish with greenish accents and warmth. Beautiful opulent fruit and very fresh, a wine that has a lot to say and will go quickly. Exciting! 14.5% alcohol. Poured pyrope ink that's not cloudy, but not transparent either, earthy aromas, leafy underbrush with vegetal accents and some gunflint. A different animal. The palate is full and rich with greenish prune-cherry fruit supported by young zesty tannins that have a warm dry splintery burr and flow into a quick prune finish. A work in progress, and an impressive one too. Deep cherry ruby with cherry rim. 2 years in tank have settled out much of the sediment, and it is crystalline. Elegant smoky nose with some gunflint and minerality mingled with elegant prune berry fruit. Great depth. On the palate it's rich, with clean fairly sweet prune fruit supported by tannins that are big, and still splintery, but have begun to smooth, and flow into a plum prune finish with some sweetness. "The real deal," says a fellow taster, and she's right. Deep black cherry with almandine highlights and black reflections. The bouquet is elegant, with brandied prunes mingled with licorice root and green leather. Beautiful harmony in a youthful key, and many facets, a wine that has a great deal to say. On the palate it's full, with bright dusky cherry plum fruit supported by smooth sweet tannins that flow into a warm slightly balsamic finish. A beautiful wine that despite its richness has no overt residual sugars to cloy the palate, and is -- again -- the real deal. Impressive, and I hated to pour it out of my glass. This is 16% alcohol and is more traditional -- grandpa's wine. It's elegant ruby with some almandine in the rim. The bouquet is powerful, with sweetness and prunes mingled with nutmeg, and it gives an impression of being in mid stride. Not quite a draft, but it's still developing and has a ways to go. On the palate it's full and rich, with powerful sweet plum fruit supported by brisk acidity that keeps the sweetness from being cloying, and by smooth sweet tannins that have some greenish accents and flow into a long slightly green prune finish with tannic underpinning. A child, but a beautiful child, who has years yet to go. 16.5%, bottled in 2008. This could be a DOC Manduria, but they prefer to keep it separate. It's deep black almandine with some paler - but not orange - almandine in the rim. Powerful bouquet with prune fruit laced with licorice root and spice, and sweetness that is in part alcohol. Great harmony and beautiful to sniff. On the palate it's full and rich, with powerful prune fruit that starts out sweet and is supported by smooth sweet tannins that have slight nutmeg overtones, and flow into a completely unexpected bright plum cherry finish with lively acidity that cleans the palate beautifully, preparing the way for another sip. And another. Most impressive, and what it is all about; it is also very young, and will age beautifully for many years. This is 16% alcohol, with 3% residual sugars. Deep black almandine with almandine rim. The bouquet is intense, with prune berry fruit supported by spice and savory accents, and some underbrush. Beautiful and great harmony; as it opens green licorice also emerges as do dried figs, chocolate and all sorts of other things. Extraordinary evolution in the glass. On the palate it's beautiful, with rich sweet spicy prune fruit laced with cherries, chocolate, spice, and more, and supported by massive silky tannins and lively acidity that flows into a long clean finish. A fellow taster says, "wowie zowie," something I won't say myself but am happy to quote. The tanks sample of the 2008 vintage of this wine is also very impressive. This spent a few months in barriques. It is 17% alcohol, plus 3-5% sugars, and is deep almandine with brownish almandine rim. The bouquet is powerful, with slight pungency and wood smoke mingled with rich dark brown sugar sweetness, candied fruit, spice, licorice, and nut-stuffed figs. Extraordinary. On the palate it's full and rich, with brilliant sweet cherry plum fruit supported by dark brown sugar sweetness and brilliant acidity that keeps it from being at all cloying, One could go on, and on, but the word "superlative" comes to mind, and fellow English speaking tasters are saying "wow" and "amazing." Extraordinary elegance, finesse, and harmony. Impenetrable almandine with brownish rim. The bouquet is amazing (yes, I finally use that word in a tasting note); as Enzo was decanting it it smelled of candied cherries and dark rich chocolate, and that's the beginning. Extraordinary harmony and there's also cinnamon, honey, dates, delicate tobacco, cherry liqueur, hints of white truffle, brown sugar, and it just keeps on going. Superlative; we're on another planet. On the palate it's creamy, and extraordinarily fresh, a caresse on the tongue with beautiful cherry strawberry fruit supported by clean dark brown sugar sweetness with some spice, hints of licorice, and acidity - such acidity! - that keeps things firmly in line, and fresh and youthful. Astounding; it's one of the finest wines it has ever been my fortune to taste, and any score I gave it would be insufficient. 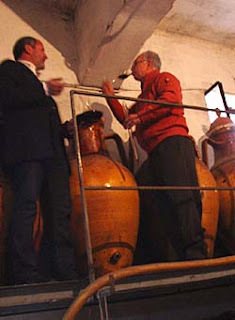 We finished with Vittorio climbing up under the eves to remove the cap of a Capasone, a 5-foot tall glazed amphora that was filled more than 20 years ago, and whose label has long since fallen off. The wine within is deep brownish almandine with brown almandine rim. Dark and very rich, like velvet. The bouquet is beautiful, with dried fruit and prunes mingled with nutmeg and plump raisins and dark brown sugar and licorice root, while there is deft almost mineral acidity to keep it on its toes. I could continue as it opens, but it would take pages. On the palate it's silky, with rich plum cherry fruit supported by spice and dried fruit, and also by brown sugar sweetness and bright berry fruit acidity that keeps it on its toes. Extraordinary harmony, and a truly great wine that will age indefinitely. Rich, powerful, and so much more. A revelation. I discovered Sant'Appiano, an estate in Barberino Val D'Elsa, in a roundabout way: Paolo Baracchino asked me to translate his notes from a vertical of Monteloro, the estate's 85-15% blend of Sangiovese and Colorino, and the wine sounded good. 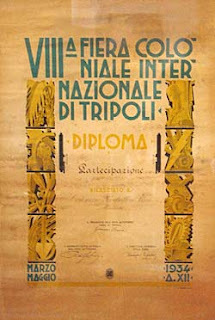 But I was working through my notes from the Tuscan Anteprime at the time, and let the matter rest. 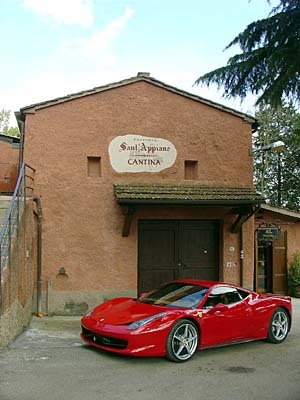 However, this April Valentina Paolini invited me to a Ferrari-Maserati meeting at Sant'Appiano. An opportunity to look (longingly) at many Ferraris is something not to be missed, and after admiring the cars we had a fine lunch at the Osteria L'Antica Quercia, Sant'Appiano's restaurant (which included an excellent antipasto misto Toscano), and then there was a vertical of Monteloro. Which I enjoyed, so I arranged a second visit and drove over. Sant'Appiano is both a medieval hamlet perched atop a hill overlooking much of the Valdelsa, with San Gimignano in the distance in one direction and Chianti Classico in another, and the estate, which Pierfrancesco Cappelli's grandfather Domenico bought from the Bordoni family in 1960. 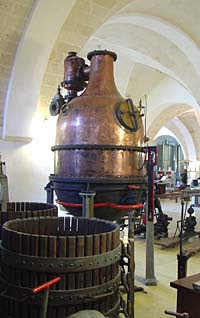 At the time it consisted of several poderi, or independent farms run by tenant farmers, and winemaking was a marginal aspect of the operation, which was dedicated primarily to seed crops. Though they still do grow wheat, and indeed have more hectares of fields than vineyards -- 120 in all, 17 planted to vine, 40 forested, and the remainder wheat fields and olive groves -- winemaking now plays a much more important role, with the cellars in the town of Sant'Appiano. 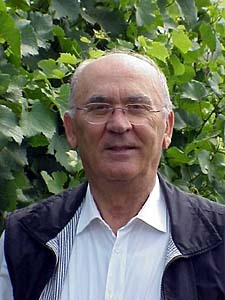 Pierfrancesco joined his grandfather on the farm in 1990. At the time Domenico also outsourced grapes, but in 1999 they decided to become independent, working only with what they grew themselves. Alas, he did not live to see the fruits of their labors -- he died in August -- but he left the farm in capable hands, and though Pierfrancesco confesses to having felt very nervous with that first vintage on his own, he needn't have. He had learned well. The wines? We'll begin with the white, and finish with the vertical. This is a blend of Malvasia del Chianti, Trebbiano and Viognier, added to increase the aromatic complexity. It's pale brassy white with greenish reflections. The bouquet is delicate, with vinous accents mingled with minerality and some gunflint, also slight floral accents. On the palate it's light, and direct, with mineral acidity and some gunflint mingled with savory notes that flow into a clean savory finish. Simple, and direct, and will work well as a summer wine with quickly cooked lighter dishes, ranging from vegetarian pasta dishes through simple fish such as triglie alla livornese. This is the first vintage of this wine, which is a rosé from Sangiovese; the must rests on the skins for 4 hours, and then is pressed, chilled well and put in a tank where the solids settle, and then fermented with yeasts generally used for Chardonnay. It's onionskin-salmon with onionskin rim paling to pale yellow. The bouquet is rich, with sour berry fruit supported by some acidity and brambly accents, also dappled shade. On the palate it's fairly full, and lively, with bright brambly sour berry fruit supported by alcohol, greenish acidity, and some light, scrappy tannins that flow into a clean fresh brambly sour berry fruit finish. Quite pleasant, and will work very well with antipasti, for example mixed cold cuts and crostini, or with light pasta dishes (including meat sauces), and will be very nice at cookouts with grilled meats and such. Expect it to go quickly, and you will want a second bottle. This is a tank sample, and is a richer, lively pink more shifted towards ruby than onionskin, with white rim. The bouquet is muted -- it was just filtered -- though swishing brings up floral accents mingled with red berry fruit. Developing. On the palate it's bright, with rich raspberry cherry fruit supported by lively berry fruit acidity and smooth light tannins that flow into a slightly greenish sour berry fruit finish. It's less brambly than the 2008, has slightly richer softer fruit, and is also a little longer on the palate. It will be quite nice and will be worth seeking out. Sant'Appiano is Chianti tout court because they're in the area between the Chianti Colli Senesi and the Chianti Colli Fiorentini. This is 80% Sangiovese, and the remainder Canaiolo. Deep black cherry ruby with black reflections and cherry rim. The bouquet is fairly rich, with cherry fruit supported by some brambly accents and hints of leather, and some spice from grapes. On the palate it's scrappy, with moderately intense berry fruit supported by leathery accents and bitter leaf tobacco, with some gunpowder too, and by tannins that have a fairly dry burr, and flow into a clean rather bitter finish with some graphite shaving accents. It's a hard, stony wine -- not quite hard as nails, but not soft, and needs another year to get its bearings; it's very much a food wine that will work quite well with rich pasta dishes, for example pasta with sugo alla Bolognese, or hearty stews. I wouldn't drink it by the glass. In short, it's about austerity, and keeps its distance. The 2008 was the last vintage of Chainti with Canaiolo; Pierfrancesco knew that it wasn't the most approachable of wines, and (taking the advice of his sales representatives) decided to replace the Canaiolo with Merlot to make the wine more appealing to the general public. A tanks sample of the 2009 is deep cherry ruby with violet reflections -- there's more violet to it than in the 2008, and this is the Merlot. The bouquet is closed, because it had just been filtered when I visited, though swishing brings up berry fruit supported by some currants and deft gunflint acidity. On the palate it's ample and fairly smooth, with rich slightly sour cherry fruit supported by tannins that have a slight burr, but are very very young, and by deft sour berry fruit acidity that flows into a clean fresh berry fruit finish with some underlying bitterness. It's approachable, but displays considerable character too; the tannins aren't as polished as those of some wines with a healthy Merlot component, and it will be quite approachable in a food wine key. In short, though I generally don't approve of the addition of International varietals, here the ploy has worked, and well. This is Sangiovese in purezza. The 2004 is a selection from the older vineyards around Cottaccio, one of the estate's poderi. They are began to replant their vineyards in 1999 (and are planting some new vineyards), and with time the wine will come from the newer vineyards. Depending upon the vintage, this wine spends 8-10 months in barriques. Deep black cherry ruby with black reflections and cherry rim. The bouquet is dusky, with brooding berry fruit supported by slight balsamic savory notes and warmth, with deft slightly mineral acidity as well. Nice balance. and graceful in a fairly ethereal key. On the palate it's ample, with fairly rich berry fruit that has a decidedly mineral underpinning, supported by smooth tannins that have dusky pencil shaving bitterness, and flow into a clean mineral finish with pleasant savory accents. Quite nice, and will drink well with grilled meats or roasts; it's more particular than many Chianti wines, with the minerality that comes from the terrain providing a distinctive personality, and it's a wine that you will either like or not. I did. Deep black almandine with black reflections and some almandine rims. The bouquet is fairly intense, with berry fruit supported by some brambly accents and slight balsamic acidity with underlying green leather. Pleasant, in a slightly brooding key, and this is in part the vintage, which was cooler and wetter than many. On the palate it's deft, with fairly rich bitter berry fruit supported by pencil shaving bitterness and smooth tannins that have a dusky bitter component, and flows into a clean fairly long bitter berry fruit finish. Pleasant in a cool weather key, the fruit has a brooding character to it that also draws from the minerality of the terrain. It's a nice expression of the vintage -- no attempt to compensate for the cooler vintage key -- and will work well with grilled meats or roasts. Deep black almandine with black reflections and lively ruby rim. The bouquet is fresh, with sour red berry fruit supported by berry fruit acidity and some balsamic notes, also minerality and slight menthol. On the palate it's bright, with lively sour cherry fruit supported by fairly rich mineral acidity with some leathery accents, and by tannins that have a slight burr to them, and flow into a clean fairly tannic finish with underlying bitterness. Pleasant in a traditional key, and quite mineral, with fairly cheeky fruit; it will drink well with grilled meats or roasts, and is a wine to seek out if you like the style, which is fairly aggressive, with scrappy tannins that have considerable backbone. If you instead prefer smoother softer wines it won't work as well for you. This is the first vintage of a Syrah, from a vineyard planted in 2000. It's impenetrable pyrope with cherry ruby rim. The bouquet is fairly rich, with jammy berry fruit laced with underbrush, earthy wet leaves, and spice. On the palate it's quite mineral, with moderate sour berry fruit supported by dusky gunflint minerality, leafy underbrush, and smooth sweet tannins that flow into a clean dusky finish with dried leaves and leathery accents, also some minerality. It's a stony wine, minerality in a glass, and if you like the style you will enjoy it. But you have to like the style. In terms of accompaniments, succulent red meats will likely be the best bet. Tank sample. Impenetrable pyrope with black cherry reflections and cherry rim. The bouquet is closed, though swishing brings up some berry fruit with wet leaves and leafy acidity -- classic Syrah aromas. By comparison with the 2007 it is richer, and this is both the vintage and the greater maturity of the vineyard. On the palate it's fairly rich, with cherry fruit laced with underbrush and supported by underbrush acidity, and by fairly smooth sweet tannins that flow into a clean dusky finish with underbrush and minerality. It's a distinct step up with respect to the 2007, and though it needs time - the bottle has yet to work its magic -- promises quite well. Monteloro started out in 1999 as an 85-15 Sangiovese-Colorino blend, fermented in an upright cask, aged in barriques for about a year, and in bottle for another year prior to release. 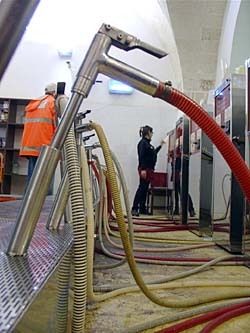 Over the years they have adjusted the blend, adding 5% Merlot at the expense of Colorino in 2003 and 2004, and 5% Tintoretto, a traditional varietal, in 2005. Deep black cherry ruby with almandine reflections and slightly orange ruby rim. The bouquet is intense, with berry and brandied cherry fruit laced with some balsam and slight leathery accents, and hints of burlap with some India ink as well, and minerality too, with hints of starch. On the palate it's rich, with powerful cherry fruit supported by minerality and deft mineral acidity with some wet bark accents, and by tannins that have a slightly savory burr and flow into a long clean rather dusky finish with underlying bitterness. Quite pleasant, and though mature has a long life ahead of it; the sad part is that there are just a few bottles left because Pierfrancesco, who didn't have many dealings with wine writers at the time, didn't think to set more aside when he made it. It's the sort of wine that will bring great joy to a table set with a porterhouse steak. Deep black almandine with black reflections and cherry ruby rim fading to orange; there's a little less garnet than in the 99. The bouquet is moderately intense, with some jammy berry fruit supported by warmth and slight mentholated accents; it comes across as a bit softer than the 99. On the palate it's ample, with fairly rich jammy berry fruit supported by deft berry fruit acidity and by smooth tannins that have slight greenish brambly notes, and flow into a clean fairly sour finish. Pleasant, and a welcome surprise, because the wine isn't cooked -- something that happened with many 2000 vintage wines -- and also doesn't display signs of arrested ripening, another problem that afflicted the 2000 vintage in many cases. It's a wine that will drink nicely with succulent roasts, for example leg of lamb, and would also be nice with hearty stews. Why the vines weathered the torrid 2000 August: Sant'Appiano's terrains are loose at the surface, but the substrate, calcareous tuffs, holds moisture well, which means that the vines are much less likely drought stress when it's hot and dry. Deep black cherry ruby with black reflections and almandine rim paling towards orange. The bouquet is fairly intense, and entering maturity, with leaf tobacco and savory acidity mingled with some spice and underlying berry fruit, savory notes, hints of quinine and India ink bitterness, also graphite shavings, and some burlap. Nice balance. On the palate it's medium bodied, and bright, with fairly rich rather balsamic savory berry fruit supported by smooth sweet tannins that flow into a clean rather green leaf tobacco-graphite shaving bitterness finish with underlying savory notes that gradually take over as the other things fade. Pleasant, and pleasingly mature, with considerable depth and will drink well with grilled meats or roasts, especially things such as leg of lamb, and will be a very fine food wine. Because of the greenish accents of the tannins I wouldn't drink it by the glass, but with food, where it will shine very well. Something well worth seeking out, if you like wines that have a degree of aggressiveness and backbone. Deep black almandine with bloack reflections and almandine rim. The bouquet is fairly intense, and clearly from a cooler vintage, with dried leaves and bitterness mingled with some saddle leather and wet salty tea leaves mingled with hardwood ash. Pleasant, though very much in a lesser vintage key; by comparison with the 2001 it's considerably less fresh, and this is to be expected in a wine from the 2002 vintage, given the rains and cool temperatures. On the palate it's ample, with distinctly bitter accents supported by some savory berry fruit and decidedly brambly bitter acidity, and by tannins that are decidedly splintery and very bitter, flow into a clean bitter savory finish. It's quite typical of a cool vintage, but also displays a pleasing grace and will work well with foods, though I wouldn't drink it by the glass, It's something for wine lovers more than casual wine drinkers, and if you are interested in this sort of wine you will enjoy it. But you have to like the style. In short, for an informed consumer, and those who like this sort of wine will find it has much to say. I was quite favorably impressed. Deep black almandine with black reflections and almandine rim. The bouquet is fairly rich, with warmth and alcohol mingled with warm slightly jammy cherry fruit supported by some greenish accents, and clean menthol and some cedar as well. Nice depth, and though it's from a hot vintage it's not cooked, and this is a very nice thing by comparison with many 2003 Tuscan wines. On the palate it's ample and comparatively soft, with fairly rich decidedly sour bitter mineral cherry fruit supported by dusky bitterness and moderate mineral acidity, and by tannins that are smoother and softer than those of the 2002, and flow into a decidedly bitter finish that settles into considerable dryness with leathery accents and continues at length. It's a nice expression of the vintage, and successful; they managed to avoid the overripeness that is so common in the 2003 vintage, and consequently the wine doesn't have that heaviness that so many 2003 vintage wines display. It will be quite nice with foods. Deep black almandine with black reflections and almandine rim. The bouquet is intense, with jammy berry prune fruit supported by some menthol, slight sweetness, and by dusky greenish acidity, with a fair amount of vinous warmth as well. Much more powerful than the 2003. On the palate it's ample and rich, with powerful cherry plum fruit supported by graceful berry fruit acidity and by tannins that have fairly intense bitter graphite shaving accents that flow into a clean bitter graphite shaving finish with some brandied cherry accents and hints of licorice root and sea salt -- and a fair amount of alcohol too, that gives an impression of sweetness. It's powerful, and brooding, a wine that demands attention in a rather garrulous way at the outset, though it does settle as it opens, and that will drink quite well with rich meat dishes, ranging from stewed game through leg of lamb. It's particular, and if you like fairly aggressive slightly greenish wines you will enjoy it, but you have to like the style. We're far removed from the smoother softer Merlot-based international-style wines here. And I'm not complaining. Deep black almandine ruby with black reflections and almandine rim. The bouquet is fresh and rich, with bright jammy berry fruit laced with candied cherries and some bramble, with hay and prune fruit supported by some greenish vegetal spice, and hints of wet leather that add depth. Pleasant, and a step up from many wines of the 2005 vintage, which was overall cool and rainy. On the palate it's medium bodied, with rich slightly jammy berry fruit with underlying prunes supported by tannins that are fairly smooth, though they have slight dusky splintery accents, and by dusky acidity that flow into a clean fairly rich slight savory finish with some bitter pencil shaving overtones, that extends at length, gradually settling from prune cherry fruit to savory tannic notes. The finish is a little thin, and this is an effect of the 2005 vintage, which was cool and wet, and therefore has fruit that is less ripe, but is impressive and will drink quite well with grilled meats or hearty stews. It will also age nicely for 5-8 years. This is a barrel sample. Deep black almandine with black reflections and some almandine in the irm. The bouquet is deft, with vinous accents and berry fruit supported by savory spice, and though it's obviously developing is promising. On the palate it's ample and rich, with elegant cherry prune fruit supported by moderately intense savory slightly balsamic mineral acidity and by smooth sweet tannins that are softer and more polished than those of some of the older vintages, and this is the 2006 vintage at work. It will be very pleasant, and worth seeking out, especially if your tastes are more traditional, though even a modernist will find things to smile over, especially if the wine is accompanied by a steak. I enjoyed Sant'Appiano's wines. They provide excellent expressions of their terroir -- they are more mineral than fruit driven, and this is because of the soils -- and have quite a bit to say. Pierfrancesco and his collaborators, the agronomist Giovanni Capponi and the consulting enologist Marco Mazzarrini are doing a fine job. Curious about Sant'Appiano? They have a nice site, which also includes a section devoted to the Osteria and their Agriturismo, which consists of 8 apartments in the hamlet, and would be an excellent base for exploring central Tuscany.